Thousands of people have had the chance to tour the Veteran and experience her charm. Now you can be a part of Veteran's history. FRIENDS OF THE VETERAN is a charter group formed to support this iconic vessel. Gig Harbor BoatShop's acquisition of the Veteran in 2017 resulted in a unique opportunity for the nearly 100-year-old locally-built commercial fishing vessel to serve as a public resource and as a link to our maritime heritage. Aboard Veteran, community members are invited to participate in one-of-a-kind experiences and educational programs. Boarding Veteran, participants recognize the unmistakable presence of her rich history. This is a special boat indeed. Friends of the Veteran was developed as a way to support and care for this historic asset. Friends of the Veteran members will work together to maintain, operate, and enjoy one of Gig Harbor's most distinctive commercial fish vessels, now back home almost a century after she was first launched. By becoming a Friend of the Veteran, you too can be a part of the legacy of the hundreds of local fisherman, skippers, and others who have worked aboard and maintained this classic vessel. Join us! Invitations to volunteer aboard Veteran - an authentic way to experience workboat culture firsthand. Volunteers enjoy camaraderie, a sense of satisfaction with a job well done and, at the conclusion of most days, relaxation and refreshments aboard Veteran. Opportunities to volunteer during on-the-water excursions and boat trips. Patrons of the Veteran receive all of the above benefits, plus special name recognition memorialized on board the Veteran. Individual Friend of the Veteran memberships are $250 per year. Individual or household Patron of the Veteran memberships are $1,000 per year. Passengers aboard Veteran observe local fisherman plying the waters for salmon during a Fish Stories excursion. 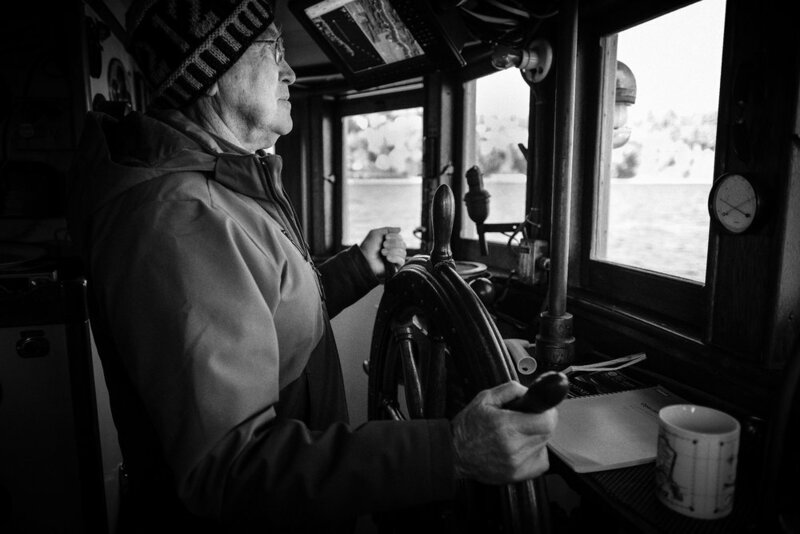 The Veteran wheel is steeped in decades of workboat history. Jaime Storkman, Bruce Smith, Cindy Hackett, and Diane Nason working together to refresh Veteran's paint. Blustery winds and rain don't stop folks from enjoying an excursion aboard the Veteran. Patt Lapp prepares coffee and treats in the galley during an excursion. 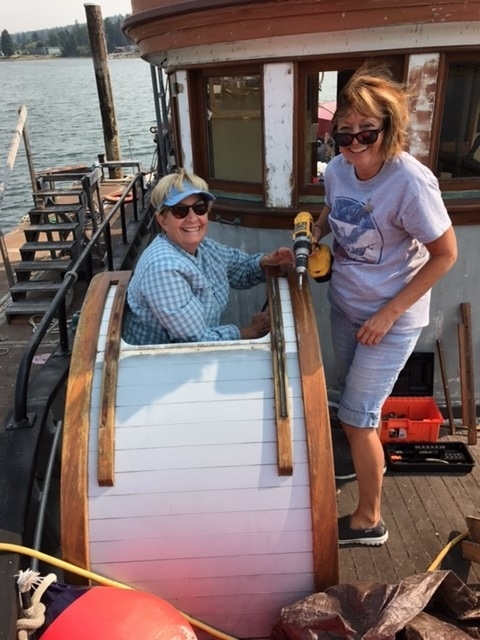 Patt Lapp and Dawn Ellis at work on the scuttle. Spring 2018 (Dates TBD): Travel to Port Townsend for annual maintenance haul out. Summer 2018 (Dates TBD): Volunteer on board during excursions. Gig Harbor BoatShop is a 501(c)(3) nonprofit organization. Your membership benefits include a 10% discount on merchandise and member discount on workshop fees. Per IRS regulations, the tax-deductible portion of your membership is limited by the stated fair market value of the goods given in exchange.